Bioshock is a fairly complicated game made out of simple pieces. I find that most games that I like, Bioshock being one of them, have a design that almost spells itself out to you as you play. Bioshock still leaves lots of flexibility and provides elemental pieces that the story leads to you. In this way, the progression in the game is kept interesting even though the classes of characters you fight is very limited. Up unto this point there haven’t been and SPOILERS. If you don’t want any SPOILERS…please stop reading here. The story in Bioshock took me a little to get into. For me the key to a good story in a game is to involve the character in nearly every game event. Bioshock really does base the story around you and the progression (I went good, saving all the little sisters) makes you feel involved. I wasn’t hooked until the midway point and I didn’t think the story came together at all until the last three levels. Overall the story arc of first being intimidated by the big daddies and then having to become one to defeat Fontaine was awesome. The key thing Bioshock has taught me about story telling is to build up relationships and questions at the beginning of the game and then turn both those relationships and the need to get answers on the player later. I am always a sucker for games that have different endings. Even if I never watch them all myself, knowing they are there is a draw to a game for me. Must be the result of Wing Commander burning branching story into my mind as an early gamer. As a first person shooter, the interactions in the game are basically all with weapons and plasmids. The amount of selection is incredible. With about 6 weapons and at least 2-3 ammo types per gun there are up to eighteen options with guns. The ammo types are a great way to scale weapon firing types without having to model anything more from the gun. But then there were 5 weapons that could be upgraded as well! So the amount of customization is handled very nicely by just having a few additional visual meshes on the weapons. Having a camera/research element was a great way to get the names of the creatures you face as well as making you realize that your opponents are different even if they look the same. Plasmids are probably the most unique element of the game and they opened up some very interesting options. Much of the base elemental stuff like fire, freezing and electricity was shared with the ammo so you could get interesting shared effects that make implementing features like this much cheaper on the engineering side. The things that weren’t in weapons were story elements like the insect swarms and the hypnotize big daddy. In this way, nearly everything gets repeated use and can function as a weapon. Taking over turrets and security bots was another great way to increase your firepower and play with different tactics. Crosshair glue: I’m not sure if this is the same as the above or not, but it seems like you get slowed down on your target. The assistance they give makes this work as not only a twitch shooter, but it also works for RPG fans that don’t want all the precision aiming. Outside of upgrading your weapons/plasmids, there were several things to enhance yourself with in three different categories. Having the upgrade system in the game not be point based and having it fit in with the game fiction was a very clever choice. I never felt removed from the world fiction when upgrading myself. The self gating of the slots by having to pay to open new ones was great to limit characters within the world fiction. There is a good selection of enemies. Something like 3-5 splicer variant models used to make up numerous classes of splicers. A few classes of big daddies. Security bots, turrets…and that is about it outside of boss battles. They make so much out of so little it is awesome. 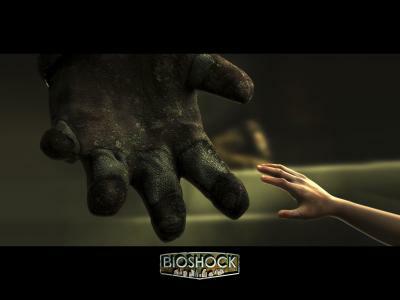 Many people marveled at how Bioshock looked and gave the engine credit. I do think that their engineers did a great job, but what really makes Bioshock shine is the consistent art direction and the delivery of those assets. In a game like this, and in most first person shooters, you need to spend more effort on the world than you do on the characters. The amount of style this game has is awesome. The world assets are all solid and reusing these assets never gets old. This game also paints a vibrant picture with lighting. I don’t think I have seen another game that can get away with using so many primary colors in lighting and not look completely fake or over the top. I think that great games could run on any system and I think Bioshock could have been an interesting game as a side scrolling game. I don’t think it takes technical innovation to make great games anymore and I think Bioshock’s success is grounded in execution and substance, not technical flair. This entry was posted in Game Breakdowns, Game Design and tagged bioshock igamemaker design breakdown. Bookmark the permalink. You left out one important aspect. Sound. The sound in this game is incredible. This is something i’ve noticed making a difference in a lot of these sorts of games, and something that has come along way over the past couple of years. This game and Dead Space have done an amazing job with the sound, it really keeps the environment and the feeling of being there alive. Keeps a boring elevator ride interesting, and gives the general tone of the game. Games that have done sound poorly recently: see Fallout 3. Blech.